Printed book plus PageburstTM access – you will receive a printed book and access to the complete book content electronically. PageburstTM enhances learning by not only bringing world class content to your fingertips but also letting you add to it, annotate it, and categorize it all in a way that suits you. PageburstTM frees you to spend more time learning and less time searching. 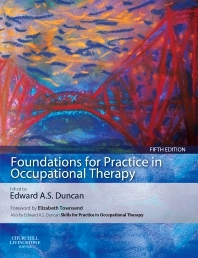 Now in its fifth edition, the internationally acclaimed Foundations for Practice in Occupational Therapy continues to provide a practical reference tool which is both an indispensable guide to undergraduates and a practical reference tool for clinicians in the application of models and theories to practice. Underlining the importance and clinical relevance of theory to practice, the text provides an excellent introduction to the theoretical basis of occupational therapy. Contributions are given by both academics and expert clinicians. All chapters have been revised and updated, new ones have been written and some pre-existing chapters have new authors. A refined structure uses highlight boxes to indicate the key themes and issues of each chapter and useful reflective questions to help the reader review the issues raised in the chapter.